I had to wonder if I was in Holland or really in Southern California basking in the enormous flower field. 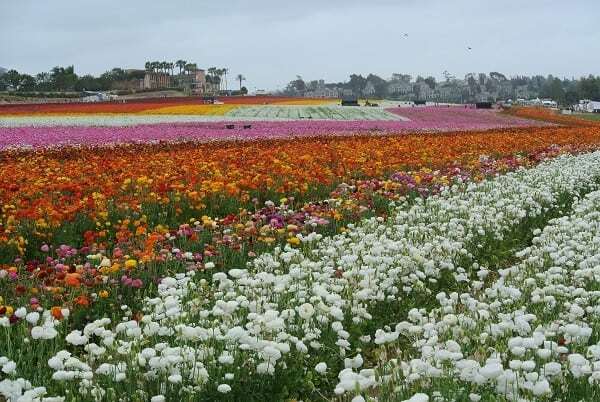 Known for top rated beaches, cool surfing spots and snappy Legoland, Carlsbad, just north of San Diego city, is the motherlode of blossoming Ranunculus flowers. On a hillside just one exit from the Interstate 5 freeway are 8 million flower bulbs lined up in harmony and popping with layered colors. Once known as a sleepy coastal community, Luther Gage knew fertile land when he saw it and planted the seedlings 85 years ago. 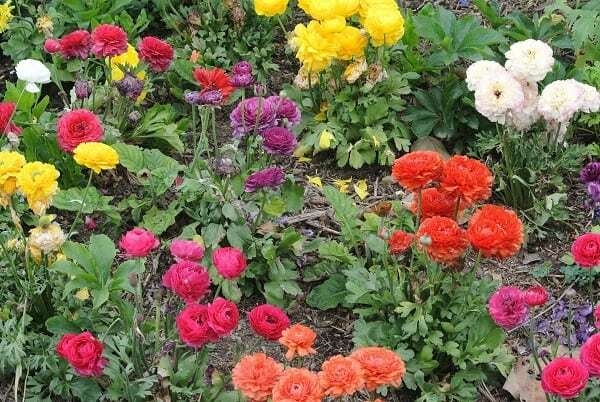 Along came farmer Frank Frazee and they developed a co-op between the two with their farms and growing ranunculus flowers. Nearby, the Ecke family grew the famous red poinsettia plants popular at Christmas time. The three families worked together and probably had no idea they were the catalyst for this international tourist attraction. But what is a ranunculus flower? Originally from Asia Minor, it’s described as rose-like with layered petals. General Manager, Fred Clark of the Carlsbad Flower Fields, is the person in the know and set aside his pruning shears to talk with me. He said the beauty of the flowers is the density and brightness of the colors. The farm ensures flowers grow with straight stalks to be cut and sold as flower bouquets. Only 10% are cut in keeping with florist quality and then sold locally and worldwide. The cut flowers will keep in a vase with fresh water for at least 10 days. When the blooming season is complete, bulbs are dug up and sold. Clark said their particular ranunculus species are the Tecolote giant variety. Tecolote owls used to burrow in the fields and hence the name Tecolote flowers. A bit of information not readily seen by the eye, is that the flowers are planted in a chevron pattern to highlight the colors throughout the blooming season. Clark signaled volunteer “Ambassador” Steve to take me on a guided tour in his electric cart. There is much more on display than I ever knew. As a young person, I’d see the flowers while driving on freeway 5 and knew when I was in Carlsbad because of the flowers. Over time, buildings paralleled the freeway and I lost sight of the fields. But now, much more has been added to the attraction which brings 160,000 visitors a year. On the lower level are many exhibits within easy walking distance on a flat surface. We have all seen rose gardens, and what makes this garden special is for the guests to find a rose with their year of birth. Another fun activity, for all ages, is walking through the sweet pea maze. Tall and grown close together, back and forth from one end to the other, adults and kids tried to figure their way out. Poinsettias are very popular and like a celebrity, have their own private residence. Recognized worldwide during holiday time, many people are surprised to see them in colors of white, pink, and yellow, orange and of course, red. There is a name by each species, including the Jubilee family and Orange Spice. And there is even something for the orchid lover. 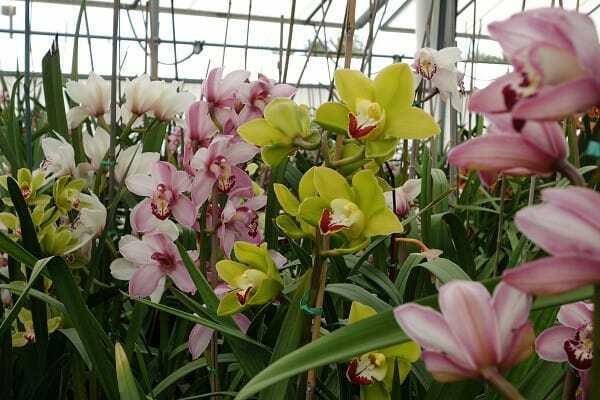 An A frame enclosure has multiple rows of stunningly beautiful Cymbidium orchids sitting on benches and graciously attracted to the filtered light above. Kids are entertained with not only the beauty of nature but the sluice mining. After entering the grounds, kids are given a paper passport and excitedly run area to area getting a stamp on the passport. Once the passport is full of stamps, they take it to the old western looking sluice mine and sift through the sand and water for gems. Tips on how to garden and save water are provided by Master Gardeners and the Water Wise exhibit. Although California is in a drought, the field has entered into a water sharing agreement with Carlsbad City to use reclaimed water. 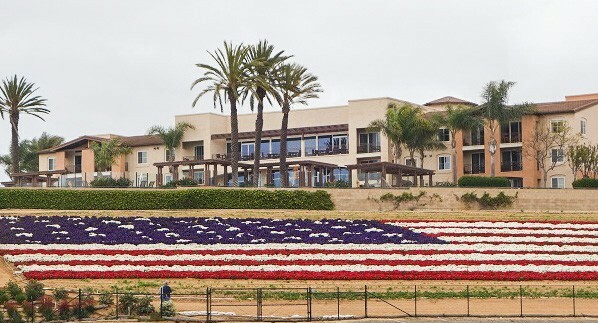 Not to be missed is the American flag of flowers which is a waving flag of red, white and blue petunias measuring 300×150 feet. It’s a good idea to ask staff where the vantage points are to get the best pictures of the massive flag. The fields are accessible on the lower side and moms with strollers and those needing to take it easy will find benches to sit among the gardens. If one is not up to walking on the inclined hills, explore the fields close up by hitching a ride on tractor wagons. 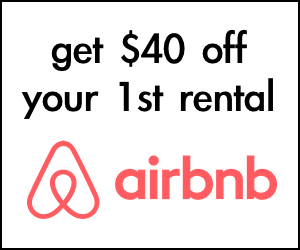 Rides are $5 for adults and $3 for children. Unbelievably scenic is the view from the top of the hill with the Pacific Ocean on the horizon beyond the flowers. Adding even more to all the flower fields have to offer, are the special events of music, photography workshops and renting the barn for weddings and other venues. 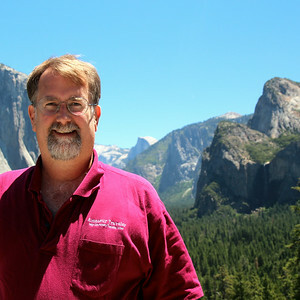 Their website www.theflowerfields.com is packed with lots of information and admission tickets may be purchased on-line. Enjoy the day by bringing a picnic to relax and take in all the natural beauty. And don’t be shy to talk with ambassadors and a few employees in their 90’s who love to share their passion about gardening. Thanks to the Carlsbad Flower Fields for hosting me, as always, my opinions are my own. Interstate 5 freeway North or South exit Palomar Airport Rd to the east. Turn left just one block to the east at Paseo Del Norte, and immediately to the right is the entrance for the flower fields. Parking is free.